Piping systems made from Polybutene-1 demonstrate exceptional performance in a variety of demanding long-term applications and have become a vital part of modern energy-efficient and ecologically acceptable building technology resulting in the rapid worldwide growth in usage for the product in recent years. The extended period of time PB-1 delivers to its intended use before the need for replacement, helps to define its level of sustainability. Modern, PB-1 heating and cooling pipe systems used in homes and commercial buildings enrich daily life by providing energy-efficient comfort, which creates optimum working and living conditions. 1. The period of time for which a product fulfils its intended use before the need for replacement - otherwise known as its sustainability. 2. The negative impact a product has on the environment during its manufacture and use, both in terms of its fuel efficiency and environmental damage, and taking into account also the possibility of recycling. Polybutene-1 has been successfully used in pipe applications in Europe for over forty years. Installations in District Energy (heating and cooling) and Underfloor heating systems made in Austria and Germany in the early 1970s are still in trouble-free operation today where in the same challenging application, metal pipes had previously proved unsuitable due to rapid corrosion problems. The sustainability of PB-1 pipes is well proven based on the experience of actual long-term end use performance. Since these first installations, advances in both material technology and production processes, combined with the introduction of stringent international and national standards, has furthered advanced the performance and reliability of PB-1 systems. International standards protocols now specify a minimum performance for PB-1 hot water pipes of 70°C, 10 bar pressure, for 50 years. Regarding hot and cold water piping systems for new building projects, PB-1 piping systems have clear long-life and operational benefits over competitive products which make it an excellent choice based on sustainability criteria. Polybutene-1 is classed as 'environmentally friendly' (Technical University of Berlin) – consuming less energy during manufacture, conversion, installation and use than its competitors; and as a polyolefin raw material, PB-1 can also be recycled. Freedom from corrosion, scale build-up, encrustation and calcium carbonate deposition, ensures the long-term efficiency of PB-1 pipes for drinking water, heating and circulation. The issues of sustainability, energy efficiency and environmental impact have come to the fore over the last few years. The legislative pressure which affects the construction industry is being driven by the EU ‘Energy Performance in Buildings Directive’ which has already had a profound influence on member governments who have independently introduced their own new building regulations. The guidelines for ‘sustainable buildings’ demand that the impact on the environment and the associated consumption of energy costs and resources is minimised throughout all phases of the life cycle of a building from planning to demolition. In terms of flexibility, expressed as an elastic modulus in the table below, Polybutene-1 is clearly the product of choice. Flexibility is a key PB-1 benefit because it enables easier and faster installation. 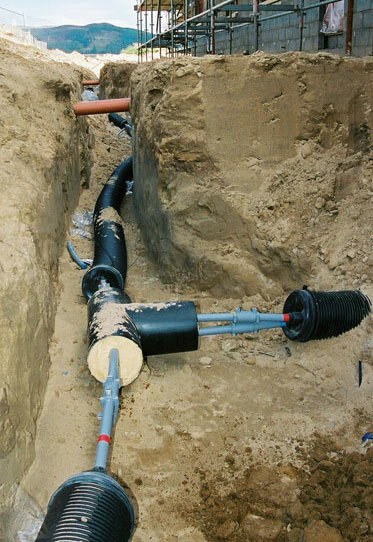 The ease of cabling pipe through drilled holes and threading through confined spaces, combined with long pipe runs and a consequent reduction in the number of fittings required and connection points, are all factors which contribute to the speed of installation and associated reduction in costs and increase in system integrity. In addition to the benefits of easy installation, PB-1 pipes provide completely corrosion-free drinking water and heating pipe systems. Freedom from corrosion means there is no contamination of the water at the tap by products of corrosion. Freedom from scale build-up and encrustation in hard water supply areas is guaranteed. Smooth internal pipe surfaces combined with inert chemical properties leads to the elimination of calcium carbonate deposition, ensuring long-term efficiency for water heating and circulation. The flexibility and elastic properties of Polybutene-1 ensure that pipes will not burst or be damaged by freeze-ups during cold weather. The low thermal conductivity of Polybutene-1 means that hot water pipes are cooler to the touch than conventional metal pipes and the incidence of condensation on the pipes is reduced, providing a safer system. Due to low thermal conductivity, combined with the fact that thermal expansion is accommodated by the inherent flexibility of the material, Polybutene-1 piping systems are quiet with no water hammer and minimal system creaking. Polybutene-1 piping systems are electrically non-conductive, providing a safer system with minimum earthing requirements. 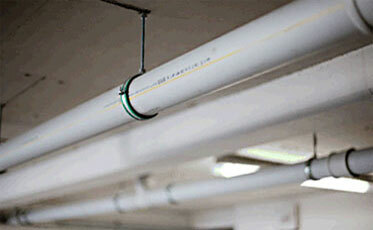 PB-1 pipes can be installed as a conduit 'pipe in pipe' system through concrete floors and walls. Such a system provides the benefit of very low maintenance. If there is ever an unexpected need to replace such an installed pipe, this can quickly and easily be accomplished by disconnecting the ends of the pipe, connecting a replacement length to one end and pulling the new pipe through the conduit into position. The flexibility of Polybutene-1 pipe makes this an easy task. PB-1 pipes are expected to have service lifetimes of more than 50 years when continuously exposed to 4 ppm of chlorine in water at 60°C. PB-1 pipes have a high level of resistance to a broad range of chemicals and are expected to have service lifetimes of more than 50 years when continuously exposed to 4 ppm of chlorine in water at 60°C. In addition, PB-1 pipe has been shown to perform for >1,000 hours in chlorine content of 30 ppm at 30°C/6 bar (Test Report-No. PB 1087C, Infraserv Höchst Technik, 2004). To raise awareness of the value that plastic pipe systems offer for a sustainable future The European Plastic Pipes and Fittings Association (TEPPFA) commissioned an independent study by the Flemish Institute for Technological Research (VITO) to measure the environmental footprint of various plastic pipe systems based on life-cycle assessment. The work was validated by the Denkstatt sustainability consultancy in Austria. An important objective was to provide transparency about the impact of plastic pipe systems on our environment. It was also an important step in the development of the Environmental Product Declarations for plastic pipes. The results of the TEPPFA study were very positive for all the application areas and confirmed an excellent environmental performance of plastic pipes for utilities and building applications.